David Perkins at High West Distillery, Park City, UT. 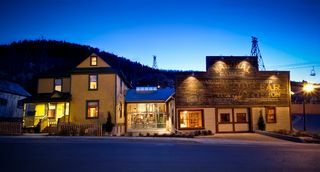 It might seem odd to be talking about a distillery and Utah in the same story, but that's the hook for High West Distillery in Park City, Utah. Thanks to relaxed liquor laws in this alcohol-vexed state, there is now a thriving distillery pub that lays claim to being the first ski-in distillery in the world. High West is the brainchild of David Perkins, who has a background in biochemistry and says "I loved to cook and I love chemistry." His two passions come together here, in a former livery stable and garage known as National Garage and an adjacent Victorian era house from 1914 that have been completely restored. The building that links them holds the crown jewel, a gleaming German-made still that cost in excess of $1 million dollars and looks like it came from Willy Wonka's chocolate factory. 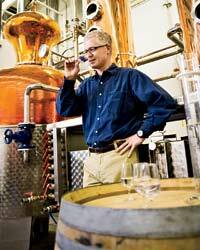 “Distilling is what brewing was in the 80's," Perkins says. The goal is making small batch whiskies, like his award-winning Rendezvous Rye, Rocky Mountain Rye (both 16 and 21 years old) as well as vodkas. "Rye whisky is distinctly American," Perkins adds. "But it may be the least appreciated spirit on the planet." High West offers flights of whisky, whisky that is meant to be drunk straight, as if one is drinking, say, single malts. Based on a flight or two, they are remarkable indeed, every bit as exciting as single malts and even more enlightening when paired with food. 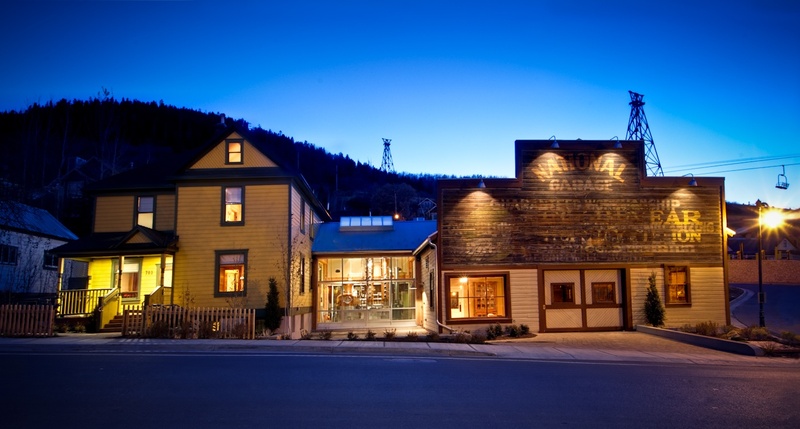 High West has a fine selection of small plates by chef James Dumas such as smoked Utah trout, a smoked dry rubbed Tri Tip with spicy slaw, and whiskey cider braised short ribs. Rye aside, for true devotees of the arcane, Perkins claims to make the world's only oat whiskey ("any grain can be used," he says) as well as bourye. 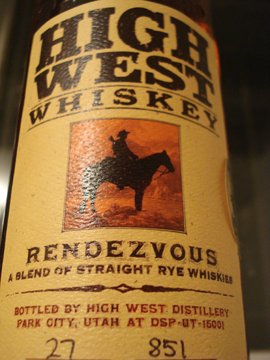 Label for High West Boureye. "My wife and I got toasty one night and came up with bourye, which is bourbon rye," Perkins says. Fittingly enough, there’s a jackalope on the label. You can have an intimate dinner in the Victorian era house or enjoy the conviviality of the open garage space, which is more to my liking. There are 37 wines by the glass but the grape seems beside the point when the grain is front and center. As for the ski-in part, it’s true. You can click out of your skis at Park City Mountain Resort and walk 20 feet to the door. But as local wags have it, it's not ski out for obvious reasons, more like a taxi back to your condo. Bottles are made in Mexico of thick, handmade glass. Based on personal experience, they will survive a suitcase ride home, even in the hands of Delta's baggage handlers. In a coffee mug, add sugar, squeeze lemon wedge, add whiskey and hot water. Stir. Garnish with rock candy stick or cinnamon stick. For more, visit High West Distillery.